Published on October 12, 2015 in architecture and general info. Closed Tags: Cape Cod, Provincetown. Intriguing image from the late 1800’s, posted originally by Ryan Curley in 2014. 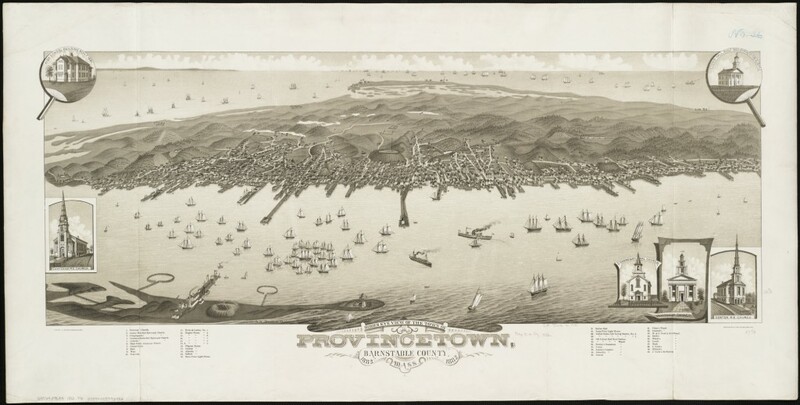 Provincetown in the late 19th century was a prosperous fishing village and an important harbor of refuge for ships traveling between the ports of Boston and New York. Prior to the Cape Cod Canal’s opening in 1914 Provincetown’s deep water harbor was vital to the East Coasts seaborne trade. Steamships bringing tourist shared space at Provincetown’s numerous wharfs with fishing schooners and other shipping. By the late 1800s Provincetown was already known as an artist’s colony. In the image above Long Point is seen wrapping along the lower right with long point lighthouse at its tip. The circular constructions off of the point are fish weirs which were used to trap fish. The square earthen berms on Long point are the remains of the Long Point (artillery) Battery that was constructed during the civil war and acquired the moniker “Fort Useless” or “Fort Ridiculous” among local residents, and proof that Cape Cod’s biting sense of humor has deep roots. The other buildings on the point are the Cape Cod Oil Works a whale and fish oil processing factory. What is known today as MacMillan Warf was then known as Railroad Wharf as the railroad ran directly out onto it. The Pilgrim Monument had not yet been built and the town was situated around the harbor with its waters being the main though fare with transportation provided by the residents’ boats and skiffs, the roads were mostly after thoughts, so you can blame the harbor the next time you get stuck on one of Provincetown’s notoriously narrow streets. In the background you can see Hatches Harbor, Race Point and the Race Point Light.